St Albans Diocese is linked with other dioceses within the Churches of the Anglican Communion, like all Church of England dioceses. 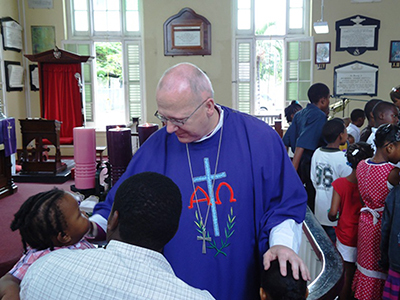 Our links are with the Diocese of the Windward Islands, the Diocese of the North Eastern Caribbean and Aruba, the Diocese of Belize and the Diocese of Guyana. Ecumenical links have also grown with the Diocese of Linköping in the Lutheran Church of Sweden, the Dioceses of Fano, Urbino and Pesaro in Italy and the Evangelische Kirche in Padderborn, Germany. 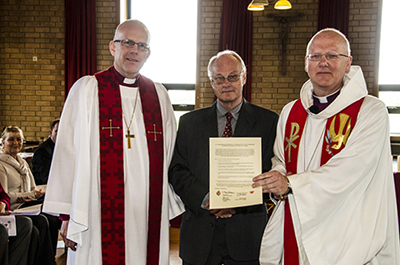 The Bishop of Linköping, John Wallace (Chair of the House of Laity) and the Bishop of St Albans (l to r) at with the renewed friendship agreement between the Dioceses of Linköping and St Albans, signed in October 2012.